Emotions and big feelings for kids are some of my favorite parenting work because I know the skills they learn now will help them forever. Knowing how to recognize, express and move through big feelings as an adult is a really important thing. Keeping the big picture in mind helps me be more patient in the moment. It’s funny how mindset can really affect in the moment reactions. I started using the term umbrella feelings as a way to describe really big overarching feelings. Those times when something really big happens and suddenly your patience is thin, every little thing feels huge and icky feelings that normally pass quickly grab hold. Those are umbrella feelings. Two specific times that umbrella feelings have come into play for us was the time Little M’s teacher left school a month early to have a baby. She loved her teacher and was incredibly sad. We are still smack dab in the middle of another ‘umbrella moment’ as all of the neighborhood kids have either moved or left for the summer. Disappointment and sadness are overshadowing everything. Those big feelings of sadness and disappointment make for more squabbles and less patience… and it’s easy to miss the connection. 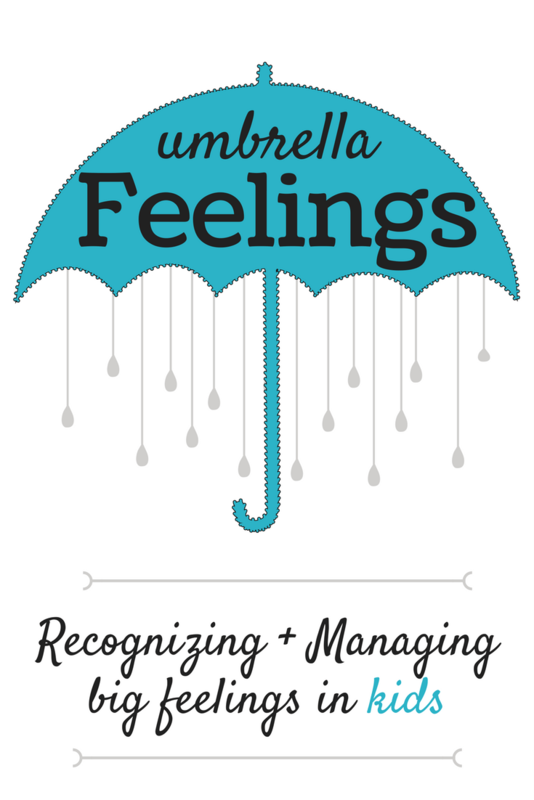 The best way to tackle umbrella feelings is to recognize them for what they are, learn how to express them and do the work to move through them. Recognize the Big Feeling. One of the first things to do when tensions suddenly run high is to really think about what changes have happened. Is someone starting school, going back to work or is someone tackling a hard skill (like potty training). Remember big feelings don’t necessarily have to look big to you! Things that feel small to you can feel big and important to your little one. The way you teach them to interact with you now will be how they interact later on with things you do think are important. Learn to Express those Big Feelings. As the parent staying calm and nonjudgmental (as hard as it is) will help your little one go through the emotion without having to justify how she feels. Sometimes just connecting the dots will solve the problem. Bringing the feelings to light and talking through them can be a great way to ease them a bit. Give the feelings a name. Sad, disappointed, frustrated, angry and anxious can all be umbrella feelings that seep into other areas. Work to Move through Big Feelings. There are so many techniques for working through emotions. Have some fun trying out different things. This is a great time for you and your spouse to chime in… what works for you? Emoji stress balls are a fun way to offer kids a positive way to work out emotions. Meditation Is an Open Sky: Mindfulness for Kids is a wonderful book with simple meditation exercises for kids. Once your little one has found something that works for moving through emotions try making a behavior book to reinforce the process. It’s not just kids who experience umbrella feelings of course. Remember in the beginning when I said “knowing how to recognize, express and move through big feelings as an adult is a really important thing”? It’s true! When you start to feel easily frustrated, find yourself yelling or notice you are reacting to things in a way that doesn’t seem to fit the situation… go through the umbrella feeling steps yourself! Does these big feelings for kids ring true at your house? Share your experience in the comments.